Nest studio is on the upper level, featuring one large bedroom with double bed and a spacious modern bathroom. Outdoors blends with indoors in this large studio, with the panoramic window views featuring nature’s ultimate artwork to complement the stylish decor. The airy interiors are awash with pure light at all hours of the day. 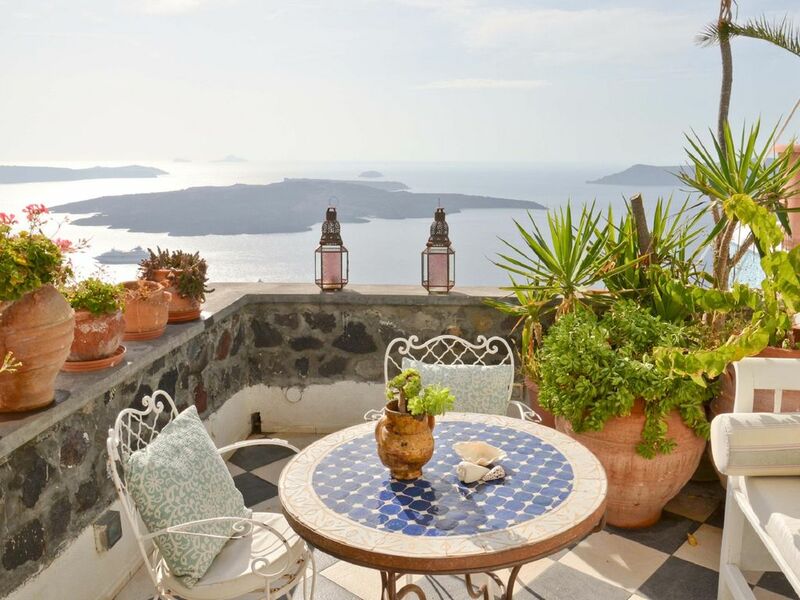 The private balcony from this vantage point provides the most amazing caldera views, as if one can reach out and touch infinity beyond the walls of volcanic stone. Here is the perfect place to enjoy morning coffee, sunset cocktails or the distant sparkling lights of Firain evening hours, with the view at your fingertips. Nest is perfect for couples or honeymooners, who will enjoy special rates and offers. The studio can also be rented together with Thea, on the third level, to create a private, two storey house for 5-7 guests. Yiannis aka John, was an amazing host and really made us feel at home. Very well situated, glorius views and tidy. The apartment had everything you could need. We stayed here for 6 days (5 nights) and while the view is gorgeous from your private patio the unit lacked some basic things and some important things. They only have a small mirror in the whole room. My gf was not happy with that. Next the blow dryer only blew lukewarm air, again my gf was not happy. Now the room has a peculiar odor. It smelt a little like sewage, but we couldn't exactly pinpoint what the smell was. And once youre in the room for any length of time you dont even notice it. Lastly, we had MAJOR problems with the A/C. It leaked water and damaged some gifts we had on the nightstand, not to mentioned the outlets were filled with water. We contacted Yanni and he stated that he fixed it. The following night water started gushing out of the unit even more so than the last time. They eventually needed to replace it. So we paid for a room we couldnt even use the AC on for 2 night. Not a good experience. Oh well, Greece is still a beautiful countyry and we made the most of it but I definitely would not stay here again. Oh and one other thing you have to hike up a bunch of stairs everyday to get in and out of your room. We didnt mind that b/c were both very active. I was beyond pleased with our stay in the Nest. Not only was it well-maintained with a jaw-dropping view... Everything about the process of renting the space was made so easy for us. We were able to arrange an early drop off because of an early flight, with no problem, and our bags were transported up the iconic steps for us, which was a wonderful perk. So, we were immediately able to begin exploring. Yannis provided us with everything we needed, including recommendations of where we should go on the island. The breakfast recommendation Eritokritos (pardon the spelling) was awesome, with fresh pastries and baked breads, a must taste. Yannis even came to our rescue before we even checked in. I thought I was lost, but didn't realize, had I driven just a bit further, we would have run right into the villa's entrance. This villa is as described. It's one of the few places I've traveled that looks exactly like what you expect when you Google it. The iconic blue roofs are all around, restaurants, not to mention... The Caldera is LITERALLY at your doorstep! Sitting out on the balcony, drinking local wine, and watching the sun set over the Caldera was one of the most beautiful things I've ever seen. The villa was truly amazing, and I can't wait to return for an extended stay. When I first saw the view from Thea I turned to my husband and cried because it was so beautiful. We had amazing sunset views on our own private balcony. There were 6 of us so we had Thea and Romance apartments which was perfect. It was like our own private mini resort. The service was amazing from cleaning to sightseeing advice and help. We loved our day out on the Quads suggested by Yiannis. Fantastic Vanilla Restaurant was at the top of the steps - we had take out on our balcony one evening. I was so sad to leave. Nothing that we saw or experienced on the rest of our trip in Greece came even close to being as great. We cannot wait to come back. I highly recommend this property. Great Views - clean apartment and genttle staff - will definetely visit again! Me and my husband stayed at Thea apartment and Nest studio for 4 days each. We really apreciate the hospitality of the owner, Yianni, he really took great care of us. On our arrival we were explained everything about the island and the things we could do, great advices that we almost did all of them! The houses were clean and tidy, the location is fabulus, close to everything but no noise heard. We were preparing our meals and enjoying them on our balcony with the caldera on our feet, so nice! Will definetely suggest it to friends and relatives and visit again in the future!